It’s favourites time and this month I have rediscovered some old faves and tried some new loves. April has gone by so fast, I will soon be finishing university for Summer and getting ready to go on holiday and soak up some much needed sun. With the weather playing mind games with us brits at the moment these favourites have been getting me excited for the summer, even if it’s still raining outside. 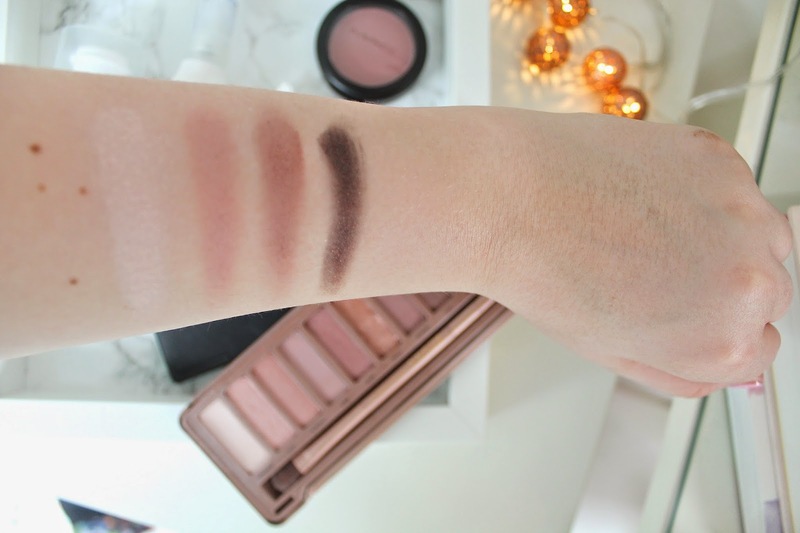 I have rediscovered my Urban Decay Naked 3 palette (£38), I have been loving purple and pink tones recently. My most used shades from this palette are Strange, Limit, Nooner and Blackheart. I have been wearing the matte shades a lot and the darker shade along my lash line. It has been my go to eye makeup recently. L-R:Strange, Limit, Nooner and Blackheart. I am all about wearing primers at the moment and I am currently using The body Shop Insta Blur (£14). This smooths out pores, fine lines and makes my skin feel soft and ready for foundation. I had a bit of trouble with keeping makeup on my nose throughout the day but this primer has allowed my makeup to stay put. I have recently discovered the Barry M Natural Dazzle bronzer compact (£9.99), I keep seeing Adam Burrell mention this product a lot on his Instagram account so I had to give it a go. It it very similar to Nars Laguna bronzer and I will be doing a comparison post on these two very soon. It is also great for paler skin tones like myself because it isn’t too orange or brown. I received a few samples from Space NK and the Jurlique rose water balancing mist (£18) has been a favourite in my skincare routine recently, I spray this in the mornings when I wake up to refresh my face and also before I apply makeup, as the last step in my skincare routine. It is so refreshing and hydrating, it also smells so nice as well. It has taken me a long time to hunt down this Mac blusher in Mocha (£18) It seems to be sold out in pretty much every Mac store. I finally managed to get hold of it and I haven’t stopped wearing it since. It is a beautiful muted pink shade which looks stunning on the cheeks with a simple eye and liner. It is currently in my everyday makeup routine. Another sample I received from Space NK was the Ren Invisible Pores Detox Mask (£19) I loved it that much I went and brought the full size. I used this twice a week on any areas I feel need a little detox and exfoliation. I tend to use this on my nose, cheeks and chin.